Adagio’s Christmas TeaAs they say, “It’s the most won-der-ful time of the year!” Thanksgiving and Christmas seasons have always been nothing short of magical for me. Although it seems impossible, I actually enjoy them even more now than I did when I was a little girl. For one thing, as an adult, I fully understand the meaning behind these holidays. For another – I not only get to enjoy the season through my own eyes, I enjoy it through the eyes of my husband, our three beautiful daughters, and our three wonderful sons-in-law (it may sound corny, but they are the sons we never had). As you can tell, I am in full Christmas season swing and am flying high! This time of year, I embrace (fully) everything about the holidays. I want to see, smell, and taste everything that reflects the season. As a “Crazy Tea Chick,” this most definitely means I expect my tea to march right along. 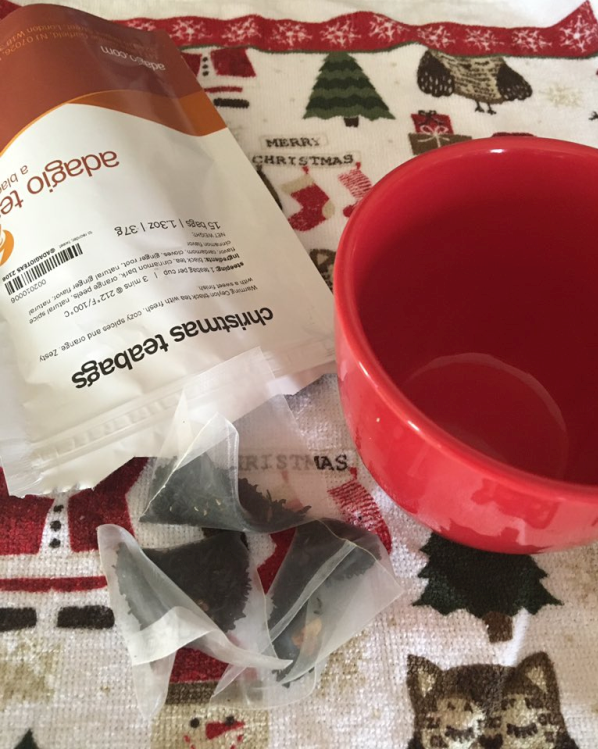 I recently ordered and tried Adagio’s Christmas Tea for the first time and I’m kind of wondering how I’ve gotten along without it all these years. The aroma and flavor are “Pure Christmas” and that is, as you know, an uncommonly beautiful thing. 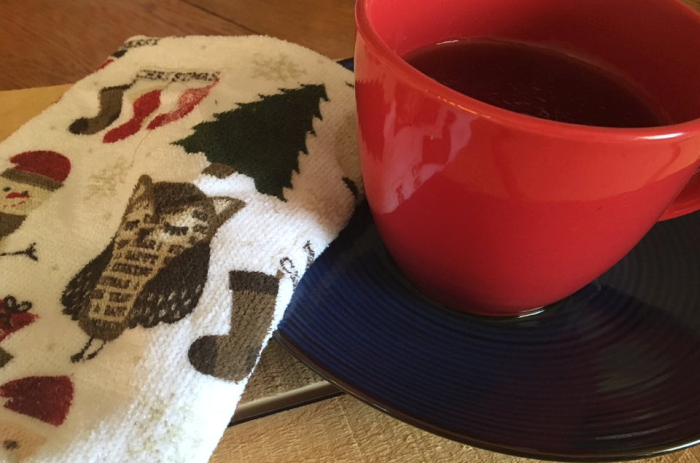 From Adagio: The tea to get you into the holiday spirit! This blend of bright, tangy Ceylon black tea flavored with warm cinnamon, pungent cloves, and orange peels is a Christmas delight. Spicy and fresh aroma, outdoorsy and cozy, with a balanced tangy flavor and slightly sweet finish. 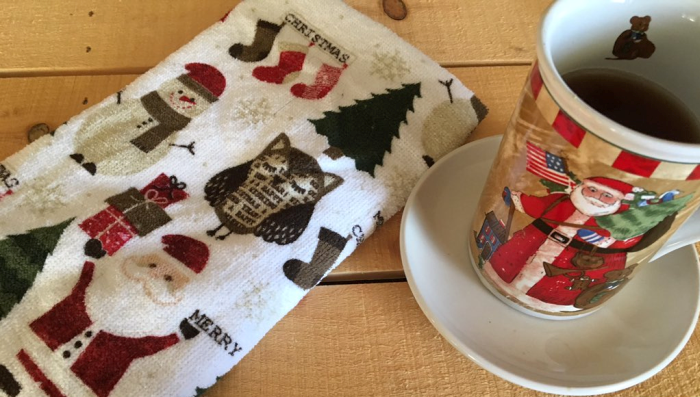 Perfect to sip while decking the halls, being jolly, or dreaming of a white Christmas. 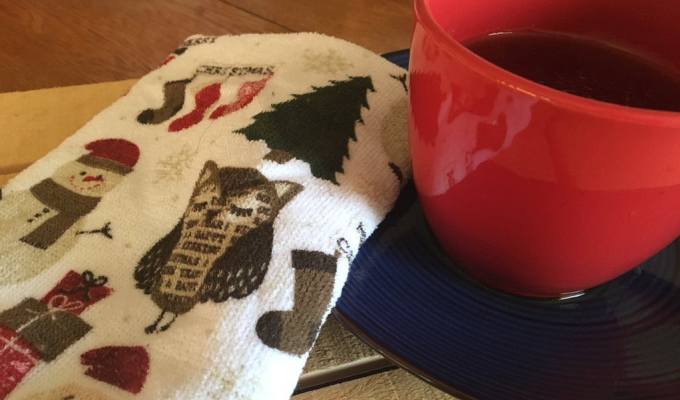 The Christmas Tea has an unmistakable Ceylon black tea flavor that I love to distraction. It also has hints of one of my favorite flavors in the entire world – Chai tea. It’s like a beautifully delicious Chai Tea meets Christmas kind of experience and I can’t get enough of it. 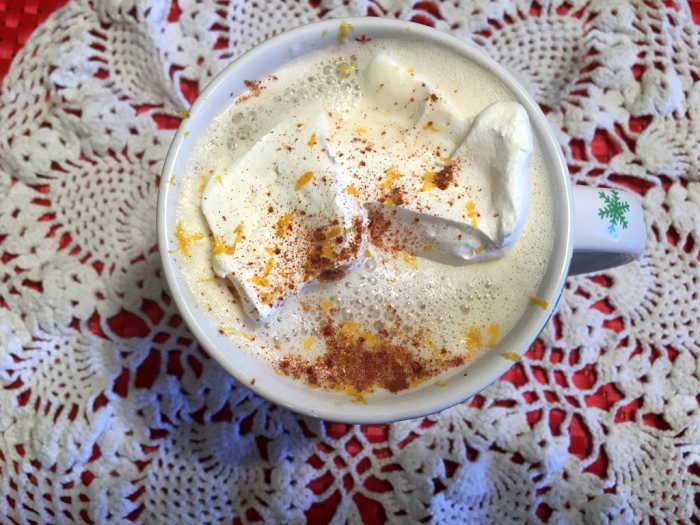 The cinnamon and orange flavors bring the Christmas and the cardamom and cloves bring the Chai Tea. However, unlike Chai Tea, I love this tea without the accompaniment of milk. I’m not sure why, but when it comes to Chai tea, I don’t exactly love it black. But add some steamed milk and… HEAVEN in a cup. Crazy Tea Chick’s Christmas Tea LatteThe Christmas tea is the best of both worlds. It’s amazing without milk and it’s amazing as a “Christmas Latte” with steamed milk (truth be told, it’ll rock your world… right around the Christmas tree and back). To make a Crazy Tea Chick’s Christmas Tea Latte (or any tea latte, as far as that goes), brew your tea doubly strong. If using loose leaf tea, use twice the amount. If using teabags, go with two (or even three if you can handle it stout!). I then pour 1 cup of milk per cup of tea into my Breville Milk Frother and push a button. However, you can also combine the tea and warm milk in a blender and process. If you happen to have a hand-held milk frother (love these! ), you can simply heat your milk, then froth it before adding it to your tea. 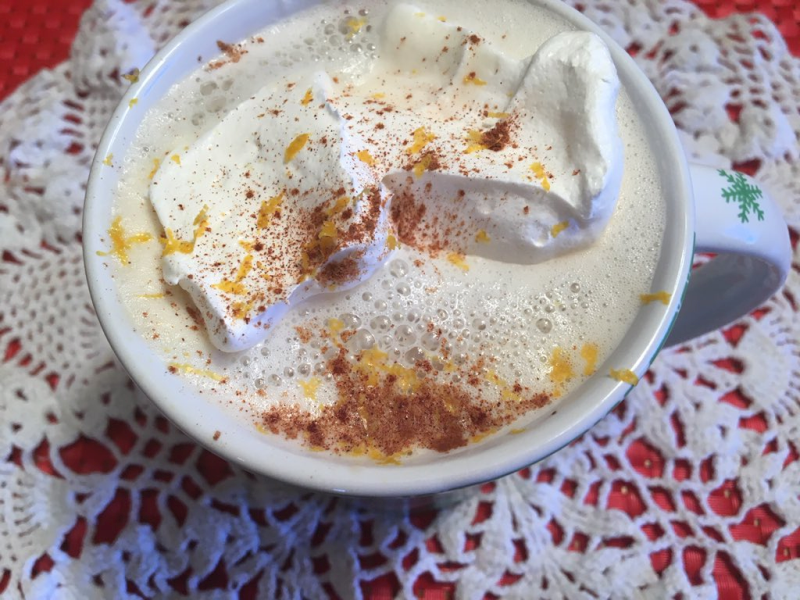 I almost always add whipped topping to the top of my tea lattes and usually a little fresh nutmeg and/or cinnamon. In this case, I go with whipped topping, cinnamon and a little orange zest. I ordered the Pyramid Teabags and they’re every bit as wonderful as loose leaf tea. You get 15 teabags for $7, which is an unheard of bargain. Adagio also has a lot of fun incentives for their customers and, as much as any company I’ve ever seen, think of their customers first and foremost. Each step of the ordering (and even post-ordering) process makes you feel that it’s all about you… which, in truth, it is! Adagio’s Christmas TeaI’ve honestly been just blown away by how they treat each order as though it were the first one they ever received. If you have ANY dealings with ANY businesses, you know how rare this is. The fact that it stands out to me says alot about Adagio, its people, how they choose to go about business, and who they choose to be. 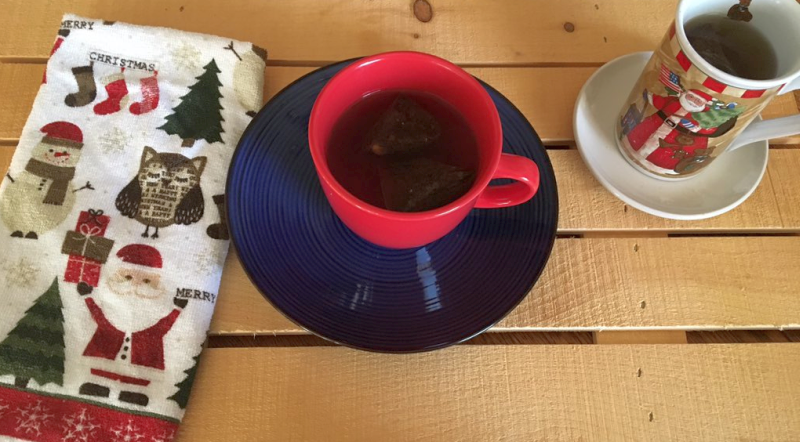 I wholeheartedly recommend Adagio teas and gift ideas. In fact, I don’t guess I could be recommending them more if my tea kettle collection depended on it!